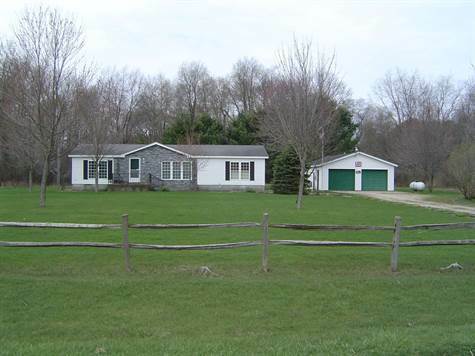 Hinton Township, Mecosta County - Very clean & move in ready country home on 11.70 wooded acres with tons of road frontage, deer, turkey and other wildlife seen almost daily and huge yard for the kids and pets to play is set off by beautiful landscaping and approx. 1 mile from Muskegon River & river side park. Home features 3 BR 2.5 baths w/ private master suite with jetted tub, shower, and his & hers closets, huge living room that is open to dining and kitchen, 4 season sun room/ family room + large mud/laundry room & 1/2 bath (new roof 2012), central air, + a 24x40 insulated/dry walled garage with furnace & workshop with 3rd door for mower/ATV's/snow mobiles or 3rd car and new roof in 2012. All this and easy access to Morley, 131, Lakeview, and Big Rapids! 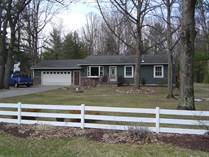 Green Lake Township, Grand Traverse County - Welcome Home: 3-4 Bedroom with over 2000 finished sq. ft., office/den, 2 bath with granite counters and beautiful tile shower, hardwood floors, central air, natural gas, high speed cable internet , family room with bar & fireplace, finished/ heated 2 1/2 car garage, paved drive , extra paved parking for boat/camper/snowmobiles, deck & patio & storage shed all set on large lot with huge yard for the kids and pets to play, and near state land 3 large all sports lakes, Arts Academy and 10-15 min. drive from TC.. Newer porch/deck, windows, well & septic, baths, basement finish/bar & fireplace added, appliances (all included) , stone work and more! All the features almost all buyers want! Interlochen, Grant Township - Newer 3 BR 2 Bath home with open floor plan, hardwood floors in kitchen & dining , island kitchen, laundry/mud room, private master suite, central air, high speed cable and internet available, and finished/heated garage set on double lot near State Land, Duck & Green lakes, river, Arts Academy / Interlochen and approx. 20 25 min drive to Traverse City . This week, across northern Michigan, business owners and residents are lining up before their local boards of review to appeal their taxes – in most cases, property taxes. Whether due to an exemption they now qualify for or because they believe a piece of property has been valued too high, people have one chance for a local formal review if they don’t agree with the assessor. Garfield Township Assessor Amy DeHaan says since 2003 the township has averaged 84 residential appeals annually – except for 2007 and 2008, which had 237 appeals both years. DeHaan, who joined the township in 2011, estimates 80 to 85 percent of those who come before its Board of Review are granted a reduction. Fred Mawson has owned Corporate Tax Resources in Traverse City since 2000, helping commercial real estate owners save money on their property taxes. Occasionally that help will mean a hearing before the Michigan Tax Tribunal, an administrative court that hears appeals for all Michigan taxes, and the next level after the local boards of review. “Income tax is black and white, but there is a lot of gray in property tax and it gets very emotional, very personal for some owners,” says Mawson, a commercial appraiser and assessor by training. Among his staff of four is a full-time attorney for cases that go to hearings, or have other legal issues. “Ninety-five percent are not a legal issue but a valuation issue,” he adds. As was the case for residential appeals in the Grand Traverse region, commercial appeals hit a high point as the economy hit its low in 2008-’09. Mawson's office filed approximately 20 cases with the tax tribunal – with cases concerning everything from large commercial buildings to golf courses. In 2014, that number had dropped by half and last year it was just four. "This is the strongest region in the state for real estate values” says Mawson, of the biggest reason for that decline. Local commercial realtor Dan Stiebel sits on the Traverse City Board of Review – with the second of two days of appeal hearings getting underway today. Stiebel says the number of hearings can range from a few dozen to 100. Due to the volume, the board doesn't always have time to delve as deeply into an issue as the assessors can. The board can also get hung up when the case isn't clearcut or involves significant discrepancies in value. He says if he happens to sell a property in the city (or anywhere, for that matter) for less than the appraised value, he always encourages the buyer to pay a visit to the local assessing office, rather than to wait until the tax assessment notice arrives in the mail. Garfield's DeHaan says when she first joined the township, it had between 30 and 40 cases filed with the state tax tribunal, and some were multi-year protests from the crash of the real estate market. “Today, I have two,” DeHaan says. When it comes to appeals, DeHaan says she always tries to understand where the owner is coming from in debating the value. Maple City, Leelanau County - Rolling hardwood acreage in southern Leelanau County perfect for walk out basement and living in quiet privacy, nature/ wildlife with access to Davis Lake and lots of State Land just down the street and short drives to other lakes, Traverse City, Lake Ann Empire, Sleeping Bear Dunes & more. In area of very nice homes. Property is surveyed/staked and ready for your up north dream home. 4Front Credit Union is opening a new branch in downtown Traverse City, national children’s resale franchise Once Upon A Child is coming to the area and several other stores are on the move in The Ticker’s latest look at local business openings and closings. Following a decision this month by law firm Smith Haughey Rice & Roegge to “consolidate our workspace footprint and move our offices entirely to the second floor” of the 101 North Park building, 4Front Credit Union President Andy Kempf confirms his company will open a new branch in the vacated ground floor this spring. Kempf says 4Front will begin renovations within the next month to convert the first floor into a full-service branch with an ATM. The credit union – which also maintains locations on West Front Street, Hastings Street, South Airport Road and US-31 – hopes to open the downtown branch in May or June, Kempf says. The country’s largest children’s resale franchise is opening its first northern Michigan location this summer at 2751 N. US-31 South next to Red Lobster. Franchise owner Jen O’Brien will begin a build-out this weekend in the 5,200 square-foot future home of Once Upon A Child, which specializes in the buying and selling of gently used kids’ clothing, shoes, toys and baby gear. “We’ll be open in April to begin buying (merchandise) for eight weeks, then we’ll have a grand opening hopefully in early June,” O’Brien says. Once Upon A Child – which is owned by the same company behind Plato’s Closet and Play It Again Sports – differentiates itself by only paying cash for items (no store credit or consignment), buying seasonal items year-round and offering bigger store footprints and inventory selection, O’Brien says. Clothing, furniture and housewares consignment shop Evergreen Consignment – which opened last summer on Cherry Bend Road in the Grand Traverse Regional Arts Campus – is moving to 720 West Front Street. According to owner Jaffe Rae Davis, the store will “reopen sometime during the month of April” in the former Edany BLT space. The company is hosting a moving sale on Saturday, February 27; the Cherry Bend Road location will remain open through mid-March. Also on West Front Street, stylist Chad Smarsty has opened The Hair Code Salon at 901 West Front (Suite B) behind Impres Salon Spa. Smartsy launched his full-service salon February 1, which offers haircuts, coloring, highlights and ombres, as well as house calls. Around the corner, Brandon Larabee, D.C. opened new chiropractic practice Pathways Chiropractic at 1001 Bay Street (Suite C) Monday. On the other end of downtown, owner Rex Rector has closed his Blue Heart Tattoo shop at 441 East Front Street and reopened the business at a new location at 508 Munson Avenue next to Terrace Shopper. The company will host a grand opening party for the new shop on Saturday, March 12. Finally, two well-known local businesses are on the hunt for new owners. Matt Hunter has put his Dockside Party Store – which operates two locations on West Bay Shore Drive and N. US-31 South – up for sale. The stores will remain open as Hunter looks for a buyer, according to real estate agent Tom Krause. House of Doggs owner Nick McAllister has also put his Grand Traverse Mall food court location up for sale as a turnkey operation. The listing includes all restaurant equipment and is priced at $145,000. McAllister is selling the company to pursue “a new career opportunity,” according to the listing. Grand Traverse County commissioners will consider a proposal Wednesday to combine two elected offices – the register of deeds and county clerk – into one position. The move could save the county $80,000 annually, according to County Administrator Tom Menzel, but faces strong opposition from staff and community groups. Register of Deeds Peggy Haines is responsible for maintaining all land records for Grand Traverse County, including deeds, mortgages, tax liens and assignments. “There are 225 different document types handled in our office,” says Haines. “Our records date back to the mid-1800s.” The department works closely with banks, title companies, builders, mortgage lenders and other groups within the construction and real estate industries. County Clerk Bonnie Scheele maintains vital county records – including births, deaths, marriage licenses and military discharge papers – as well as all civil, criminal and domestic records for 13th Circuit Court. Scheele also oversees county elections and serves as clerk to the board of commissioners. Both Haines and Scheele are elected officials who serve in four-year terms. Since Michigan law was amended in 1954 to allow for the register of deeds and clerk positions to be combined by a county commission vote, at least 34 counties have consolidated the functions, Menzel notes. However, several other counties in recent years – including Barry, Isabella and Saginaw counties – have also rejected merger proposals, citing negative feedback from communities that combined the offices and concerns over impeded services and low cost-savings. Outside groups are also closely watching the merger debate. CEO and General Counsel Jerome Jelinek of real estate services firm Corporate Settlement Solutions says Haine’s office is “critically important” to his company’s operations. “Every day for the 23 years we’ve been in existence, we’ve been in there (at the register of deeds),” he says. If property records fall behind or are inaccurate, it can have significant consequences for land transactions, says Jelinek. 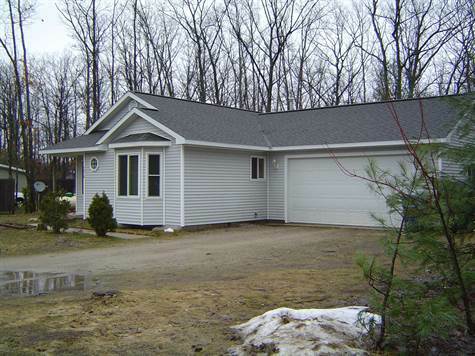 Traverse City, Grand Traverse County - Newer 2 BR 2 Bath 960 sq. ft. home with private master suite with walk in closet, mud / laundry room, bright open floor plan, storage shed, cable TV & high speed internet, natural gas, municipal water & all appliances on large 1/2 acre lot. Only minutes from TC, Interlochen, Lakes, State Land, ORV & Snowmobile trails. Sold As Is. Should qualify for all types of financing. Paradise Township, Grand Traverse County - 31.08 acres with 24x40 pole barn with electrical run inside and located in highly rated Kingsley School district on paved county maintained road and approx. 1 mile to over 1000 acres of state land, short drive to 2 rivers, Kingsley, Traverse City, Cadillac, Kalkaska. Property was surveyed 2014 & updated January 2016 and is partly wooded(cut few years ago but growing back up) with deer, turkey, wildlife spotted often, lots of deer tracks and at least 2 ideal locations for food plots. Stocks globally have been off to a bumpy start in the new year, which has spawned news articles showing concern over whether a shaky housing market could be poised for a slowdown and even a similar doom to the 2007 housing crisis. But analysts say you have no reason to be concerned. MarketWatch recently ran an article that assures Americans why they shouldn’t panic if they are looking to buy or sell a home in 2016, touching on these key points. 1. Mortgage rates will stay low. The Federal Reserve raised its short-term rates for the first time in nearly 10 years, but mortgage rates are likely to remain low, analysts say. “It would take a lot more than the volatility we’re seeing now for them to get knocked off the current course of raising rates, but will they slow down [coming rate hikes]? Probably,” says Kevin Finkel, senior vice president of Resource America Inc., a real-estate investment trust in Philadelphia. Rising rates have prompted the number of home owners who are refinancing to cool, but many already have so “rate shock” from short-term adjustable rate mortgages would be minor compared to what happened between 2007 and 2012. 2. Less risk exists of a mortgage bubble. Liar loans and higher setting ARMs helped lead to the 2005 to 2012 mortgage meltdown, analysts say, but lenders have pulled back on credit and are now, by most accounts, are overly stringent on who they give a loan too. Markets like San Francisco and New York have seen skyrocketing values recently but it’s not being fueled by loose credit standards, analysts note. 3. More aid for first-time home buyers. The Federal Housing Administration last year reduced mortgage insurance premiums on loans by $900 a year, on average. That has helped some first-time home buyers afford a down payment and enter the market. FHA loans have surged 23 percent of all financed purchases in the second quarter of 2015, up from 19 percent a year prior, according to RealtyTrac. FHA’s efforts, as well as others like Freddie Mac and Fannie Mae’s 3 percent down payment loans, may help boost the new-mortgage market this year by up to 10 percent over last year, despite the rise in mortgage rates, says Mike Fratantoni, the chief economist for the Mortgage Bankers Association. 4. Job growth. Over the past five years, the U.S. has seen a slow, steady rate of job creation. Job growth in 2015 is expected to top 2.5 million when the final tally comes in – that would make it the second best year for U.S. job growth in this millennium (following last year’s 3.1 million). A proposed new four-story hotel and the arrival of national franchise Planet Fitness in Traverse City herald a flurry of new business activity in 2016. The Ticker has an inside look at the latest openings, closings and moves across the region. A new four-story, 51-unit hotel could soon be headed to East Bay Township. Wuerfel Resorts has a purchase option on an adjacent parcel to the company’s Beach Haus Resort on US-31 North. The company hopes to build a 27,000 square-foot hotel – tentatively called the Baywatch Resort – on the site. The lakefront hotel will offer 57 parking spaces, an indoor pool and a continental breakfast area. Project representatives will appear before township planning commissioners tonight (Tuesday) at 6:30pm for a public hearing on the hotel site plan. Wuerfel Resorts plans to demolish an existing single-family dwelling on the property to make way for the resort. One of the country’s fastest-growing fitness franchises is coming to Traverse City. Ken DeBusscher and Lonni Bhirdo, who recently relocated to the area from Rochester, are targeting a March opening of Planet Fitness in the former Office Depot building next to Aldi on South Airport Road. “Planet Fitness is known as the “judgment-free zone”…it’s for people who don’t like going to gyms because they’re self-conscious,” says Bhirdo. "People can feel comfortable doing their workouts here in a non-intimidating atmosphere." The franchise – known for its affiliation with NBC’s “The Biggest Loser” – is popular for its low membership rates, which range from $10/month for a basic membership to $20/month for a “black card” membership that includes tanning, hydro massages, free guest day passes and access to any Planet Fitness location. The 24,000 square-foot location will operate 24/7 with a front-desk attendant and offer “top-of-the-line” weight and cardio equipment, including 50 treadmills. Special membership offers and pre-sales begin the first week of February. A new gourmet coffee bar and breakfast/lunch buffet has opened its doors at 905 US-31 South in Chums Corner. Pat Johnson, who owns the building formerly home to Northwest Michigan Head Start, says he launched Fast Track Café & Fast Track Buffet as an “alternative for people out here who are tired of going to fast food.” The eatery offers a full breakfast buffet beginning at 7am daily until 11:30am, when it switches over to a salad/soup bar and pizza buffet until 8pm. Carry-out is available; Johnson says the company also plans to soon offer delivery and an expanded Sunday brunch. Downtown TC remains as busy as ever heading into the new year. On East Front Street, Lake Effect Bakehouse opened its counter inside the Happy Hogg Restaurant January 1. The company will offer “from-scratch, fresh-baked goods” Mon-Fri from 6am-2pm and Sat-Sun from 7am-2pm. After five years in the alley behind Vortruba’s Leather Goods, Lilies of the Alley is keeping its name but moving one block east to the former John Robert Williams Photography space at 227 East State Street. Owner Cindy Hardy is hoping to move “by the end of the month” and says the new space will help the business “spread out.” Williams, meanwhile, has relocated to the new Grand Traverse Regional Arts Campus in the former Norris Elementary School building on Cherry Bend Road. Spice Merchant owner Lisa Freeman is preparing to transfer ownership of the Front Street spice and tea shop to managers Mark and Ginger Haworth. Mark, who notes that Freeman will remain involved in the business, says the couple is excited to branch out and begin participating in area festivals, cook-offs, fairs and culinary events. “There are so many people who don’t know we exist…our goal is to get our name out there,” says Mark. Both SugarKissed and The Little Fleet will experience temporary closures in the first quarter of the year. SugarKissed is closed now through early April for “changes that will be introduced in the spring,” according to a company statement. The Little Fleet will close for maintenance and staff R&R Jan. 12-27. Two antique stores opened their doors in the region last month. Lola’s Antiques – a “brick-and-click venue” offering both online and in-store sales of vintage items, antique books and more – celebrated its grand opening December 17 at 402 Union Street. Meanwhile, owner Brett Gourdie opened the 8,000 square-foot Elk Rapids Antique Market at 603 Bridge Street in downtown Elk Rapids December 12, welcoming “buyers, sellers and consigners of quality antiques and collectibles.” The market boasts 25+ dealers of furniture, art, clothing and more. Finally, Cherry Raceway in Fife Lake is closing after nearly four decades in operation. New owner Stephen Batzer – a neighbor of the track – purchased the property from Roger Steig through an attorney with the express intention of closing the facility, which has operated weekly on Friday nights each summer. Steig took to Facebook to express his disappointment in the closing, saying he “never spoke” to Batzer directly during the sale and that he wasn't aware of Batzer's plans to close the track.